The Native American used masks as part of their religious ceremonies, as part of ceremonial costumes, for entertainment or for medicinal purposes. The masks were often made to represent the spirits of animals, and the Pacific Northwest Indians believed that by wearing the mask, they were able to share some of the spirit’s powers. The powers they hoped to share were of strength, wisdom and purpose. The masks were constructed of wood from trees available, and the Indians made their own paints from plants. 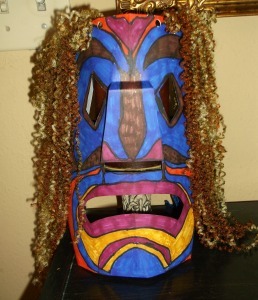 You can find the instructions for this project, Native American Ceremonial Masks in the 4th Grade Projects Gallery in the sidebar. This entry was posted in Categories and tagged 3rd Grade, 4th grade, american indian, art, ceremonial, ceremonial mask, crafts, for kids, mask, masks, native american, pacific northwest indians, projects. Bookmark the permalink.